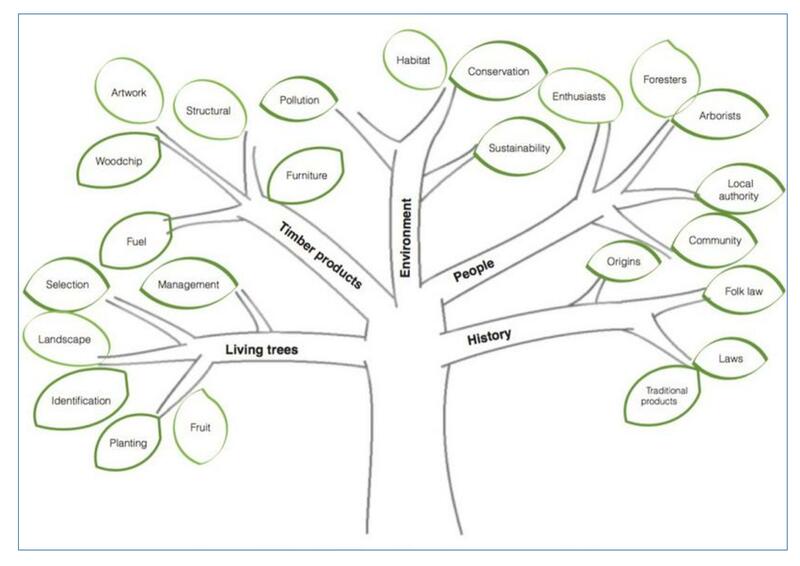 We will be adding information about trees and what we at Transition Wilmslow plan to do in order to promote greater understanding of their important role in our lives, both visually and to our general health and well-being. ‘Let’s Go Wild’ and ‘Let’s Go Britain’ have special sections devoted to trees. Look out for our articles there over the coming months. On Saturday 21st January 2017 Transition Wilmslow held an apple tree pruning class at their community orchard in Meriton Road Park in Handforth. The class was led by Gavin Mendham, who had previously completed a course at Reaseheath College, and Chris Frankland of Frankland Tree Services. Sixteen enthusiastic locals attended. The first thing that was observed was that the trees, which were planted four years ago, were generally in very good condition. It is obvious that the immediate community who live nearby and use the park have respected the trees and looked after them. It is often said that there is no absolute correct method and opinions will vary on how pruning should proceed. However, Gavin and Chris agreed on what was best for this situation and followed the principles of overcoming the three “D”s on any branch: dead, diseased or damaged. They also discussed and demonstrated how some branches can be cut away to limit problems in the future, to maximize the potential crop and to create an attractive shape. Everyone was able to have a go and it was felt that a great deal of knowledge and confidence was gained. The whole orchard looked better for the attention it received. Transition Wilmslow has three small orchards in the area and are always looking for volunteers to help occasionally. The next project is to replace three damaged apple trees in the community garden at The Temp on Gravel Lane in Wilmslow. After our first ‘Tree Meeting’ (see previous post) we’d be interested to know what you think the next steps might be, and how we persuade the Wilmslow Neighbourhood Plan group to think about the value of trees when thinking about the future of our town. We’d be really interested in knowing what you think we should be doing to enhance the trees in our locality. We are planning another meeting after the summer, but would greatly appreciate any thoughts about how we can take this forward, and what ideas from the Manchester project we could build on. John Handley (Emeritus Professor Landscape and Environment Planning University of Manchester) opened by reminding us that trees are a major part of the character of Wilmslow in both our streets and gardens. There are more trees in urban areas than we might think. For example the proportion of trees in Manchester as a percentage of tree cover for the wider Greater Manchester area is 40% for urban areas and only 20% for woodland areas. Trees are a major part of the character of Wilmslow and a significant contribution to that comes from the trees in our gardens. Moderate the climate: shelter and shade reduces energy costs in heating and cooling buildings; absorption of carbon dioxide reduces the rate of global warming; trees and twigs reduce the rate of water runoff and lessen the impact of surface water flooding. Improve health and wellbeing: shading out harmful radiation which can cause skin cancers; filters polluted air; reduces smog formation which contributes to respiratory illnesses ; reduces high temperatures which can have significant impacts on the young and old; have a positive effect on stress and other mental health matters. Contribute positively to the local economy: providing more attractive areas for businesses /customers increases the desire to work /shop; increases property values. Aids land stabilisation and reclamation; e.g at the former Newgate refuse site where trees reduce the level of methane by reducing the infiltration of water on the landfill; new growth of willow stumps on the River Bolin has protected the banks. Provide useful products: eg timber, fruit, horticultural mulch and biomass for fossil fuel. Help provide richer and more accessible wildlife which people can enjoy closer to home. Enhances landscape quality: by making towns and cities greener, more comfortable and attractive to live and work in; brings out the best in an areas local character e.g. the trees along the Carrs and roadside trees on Manchester Road, Alderley Road and Broadwalk. Contribute to more sustainable communities: involving communities in enjoying and caring for their local trees and woodlands; raising awareness of the positive benefits of trees and the need to protect them e.g. through Tree Warden Schemes. Chris Frankland (Frankland Tree Services, Ashley) shared his experience on the importance of choosing the right trees for their locality and purpose, and the critical need for proper planting and ongoing maintenance to ensure their survival. Planting in urban areas is costly and complicated due to the impact of what is both above and below ground! If trees are to survive and play their part in the urban environment we need to ensure that the right tree is planted in the right place in the right way! Pressures on public expenditure often mean that ongoing maintenance and protection of trees is not a high priority. This can lead to trees being felled for cost reasons or the loss of trees due to new development. Chris outlined how the Tree Warden Scheme, set up by the Tree Council in 1990 to provide a national force of “Tree Champions” might be used by local communities to combat this. Unfortunately pressures on local authority resources have meant that this is often a low priority. A tree’s life is not over when it has to be felled! Timber products include furniture, fuel, sculptures and biomass for fuel. We must ensure that there is no reduction in tree cover by replacing felled trees and doing some forward thinking to consider about the replacement of ageing populations of trees -an important issue in Wilmslow. Unfortunately the high cost of good quality trees, together with planting and maintenance costs means that Councils are not replacing trees or are looking for cheaper options. Gary Olsen (Furniture designer and manufacturer) believes that a large proportion of the population, young and old, has an affinity to trees. We do have choices and that finding ways to organise communities to come together is important to both raise awareness and protect our trees. He also stressed that we need to protect our trees through initiative such as the Tree Warden scheme and identify areas in Wilmslow to plant new trees. Maurice Palin (Incredible Edible) outlined some of the practicalities regarding the paperwork and liaison with Local Authorities in getting permission to plant trees. His advice was to start early, look for areas away from roads and think carefully about the type of tree you plant in terms of future maintenance. Colin Gorner ( National Trust Ranger) offered a different perspective in terms of looking at trees in Wilmslow as part of a larger landscape management environment. Having documented what there is, future needs and aspirations, challenges and obstacles a more comprehensive plan could then be put in place. Naturalistic planting should be encouraged using trees which are local to the area. A possible area for new planting, which might not incur the same difficulties/costs as planting in urban streets, could include new pockets of woodland along the river valleys. Following the opportunity to reflect on the presentations and to hang comments on “Transition Trees”, there was an overwhelming agreement amongst the residents who attended that the large number of trees in gardens, open spaces and the streets in Wilmslow are of considerable benefit to both residents, visitors and the town’s economy. However it was felt that more needed to be done to maintain and conserve what we value, think about what we want/need for the future and identify the steps we need to get there. Key concerns were the need to: enhance the protection of existing trees e.g as a result of threats arising from new development proposals, provide early warning to relevant parties on disease, decay and vandalism; and to improve liaison with Cheshire East Council on tree matters. A number of proposals were made on how to raise awareness and engage the local community including e.g : working with local schools and community groups; family tree days; workshops on tree planting and maintenance; and sponsoring a tree or an area for planting. There was considerable enthusiasm for local involvement in both the identification and planting of new areas for trees and hedges. Finally the need to take action now to ameliorate the impact of global warming and climate change was highlighted as a critical issue. Local opportunities to improve the absorption carbon dioxide could be aided by both the planting of trees and the restoration of Lindow Moss. It was agreed that the outcome for the meeting should be promulgated to local community and elected representatives and consideration be given to establishing a group of residents to take matters forward.